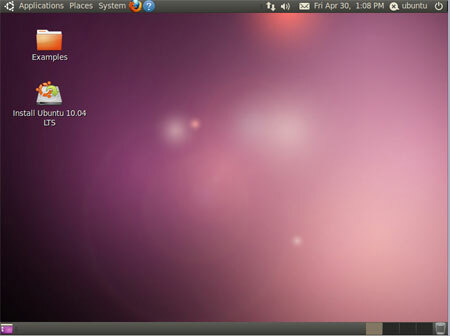 Ubuntu is one of the easiest distros to get onto for people who only worked with Windows before. And it's one of the most popular in the world. I got my hands onto it as a free CD from authors! 1*CD of Ubuntu Server edition. All were of version 10.04, as it was in September. The only downside of this free CD that it can take several week to deliver. Mine packet took a couple of weeks to arrive. All CDs (at least I tried Ubuntu and Kubuntu, but SE cover also promises it) have an option to run system from the CD without installation. So, you have Live CD which you can run on any (-ish) computer with CD drive and CD boot suport. Obviously, I've never tried Server Edition. Why? I'm not a server administrator. My first try was for Ubuntu. To be honest, that was first time I saw GNOME. I worked with KDE3 (SLAX), LXDE (Knoppix), IceWM and JWM (Puppy). What's about GNOME? It is different. I can't say if it better or worse than other mentioned window managers, it's just different. Loading time from CD was acceptable, but not ideal. Video card worked fine, colours and pictures were brilliant. So, first opinion was not bad at all! The downside? Yes, there was a downside of Ubuntu running from CD. I'd say it could be a major problem. Ubuntu 10.04 has not found my... WiFi card! What a disappointment! What it could offer me was to install drivers from the internet. But what's a point to install driver on a Live CD run? Kubuntu is the same Ubuntu, but with KDE injected instead of GNOME. For the 10.04 version it is KDE4. I can't say it was great disappointment for me, because I saw KDE4 earlier in Mandriva Spring 2010.1. But generally speaking from my point of view KDE4 is much worse (usability, performance etc) than KDE3. Of course, Kubuntu 10.04 had the same problem with WiFi card, but I even have not found a way to configuration in there. Anyway... Few days after arrival and first Live-CD run, both Kubuntu and Ubuntu found their way to... my HDD! Yes! They were installed on my computer as normal operating systems alongside with WinXP and Puppy. Problems with network card were solved by downloading drivers from the Internet. How? Via connecting my Compaq laptop to router via old-fashioned cable. Old fashioned, but still reliable. By the way, that old-fashioned way did not work on Toshiba laptop. That was a way Ubuntu and Kubuntu 10.04 found their life space on my computer. And today I knew that 10.10 is oficially released! OMG! Let me get hands on it! By the way... Why did I titled this post How to Get South African Humanity on the Hard Disk? Because Ubuntu means Humanity to others in some of South African languages. http://linuxhaters.blogspot.com/ - guy with very original approach to Linux popularisation. Don't forget to subscribe! Forms and links are on the right.